Have you ever stayed in a yurt on your travels? Traditional yurts are round, portable structures that are covered with skins or cloth. They have been used nomadic peoples in central Asia for hundreds of years. 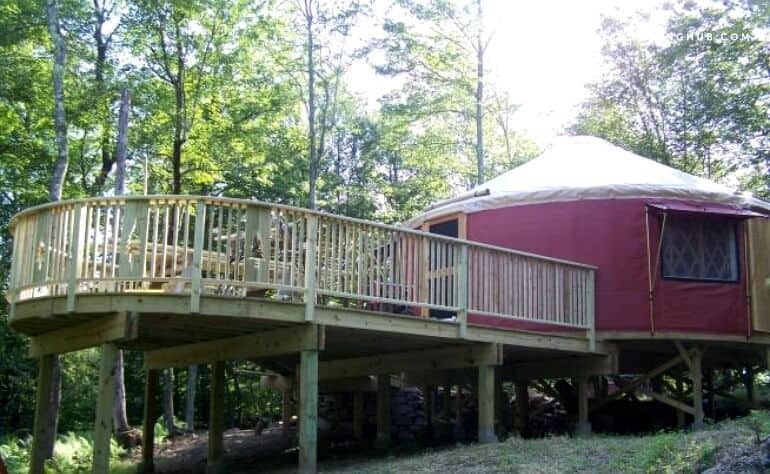 Modern yurts maintain the traditional round shape, but they vary wildly from rustic to modern. 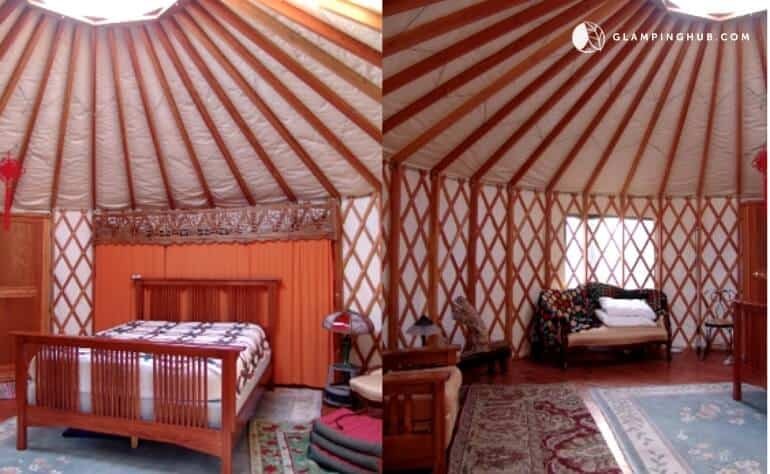 Some yurt rentals are incredibly luxurious — with bathrooms, kitchens, and hardwood floors, and others are more like camping without a tent. We’ve stayed in every manner of yurt rental, from the tiny and ultra-portable to the grandiose, and I have to say, yurts are one of our favorite types of accommodations. They’re quirky and unique, which we love, plus yurts are a great lodging option for winter travel. And speaking of winter — because it’s fantastically cold today, I’ve spent a good part of the morning over on Glamping Hub searching for a yurt rental in New York for our next little getaway. Want to know what I’ve come up with so far? Here are 10 New York yurts that you can rent for your next vacation. Please note: This post was sponsored by Glamping Hub, who also provided the photos below. Located on a 27-acre horse farm in New York’s Hudson Valley, this gorgeous yurt is just two hours from New York City and features a hot tub, a wood-fired pizza oven, a gas fireplace, and baseboard heating. This is a perfect weekend retreat, with plenty of room for hiking, cross-country skiing, or just visiting with the farm animals. Luxurious amenities include a television, an outdoor grill, a full kitchen and bathroom, and room for six guests. And did I mention that this New York yurt rental is dog-friendly? This rustic New York yurt rental is located on 50 private acres adjoining the more than 14,000 acres of public land in the Catskill Mountains. Yurt guests have access to extensive hiking trails that crisscross the property and the adjoining forest. 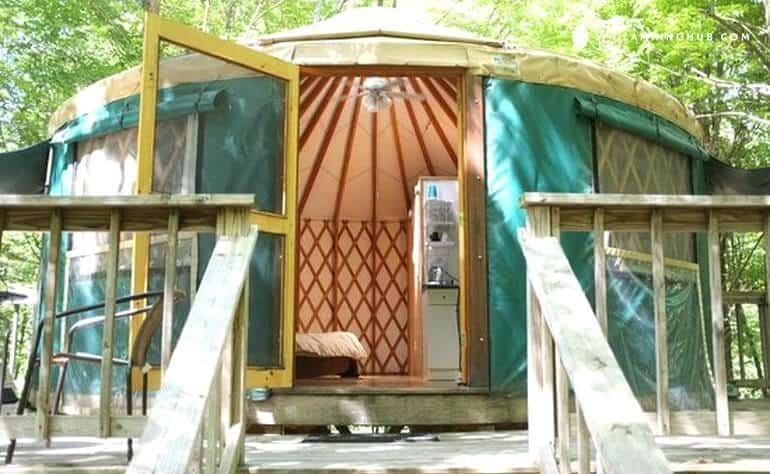 While this yurt is more like a camping getaway than a luxurious vacation rental, it offers plenty of solitude, opportunities for viewing wildlife, and an escape from the rat race of the modern world. Amenities include solar electricity, a composting toilet, and an outdoor barbecue grill for cooking. 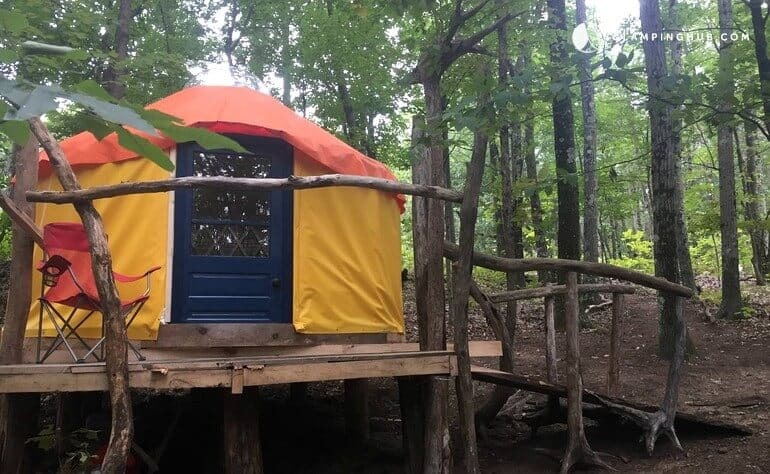 This lovely New York yurt sleeps eight people and is dog-friendly. This adorable yurt rental has room for two guests and is a perfect destination for a little romantic getaway. It’s located in Palenville, New York, near the Hudson River, the Catskill Mountains, and the town of Woodstock. The yurt features a king-size bed and sitting area, and there is an attached washroom with a small bathroom and kitchen nearby. Another cozy yurt rental in New York that is suitable for two people and perfect for a couple’s retreat, this one features 314-square-feet of living space, a king-size bed, and a full, modern bathroom. A fully-equipped kitchenette includes everything you need to prepare meals, and there is also an outdoor barbecue. 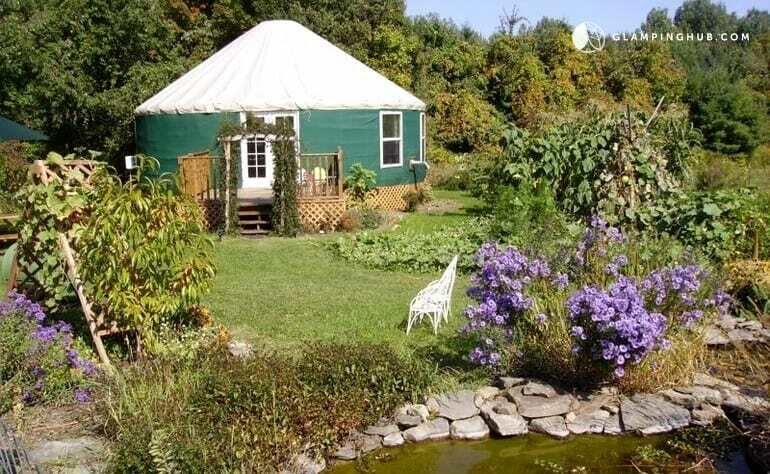 This beautiful New York yurt is located in East Meredith, in the beautiful Catskill Mountains. 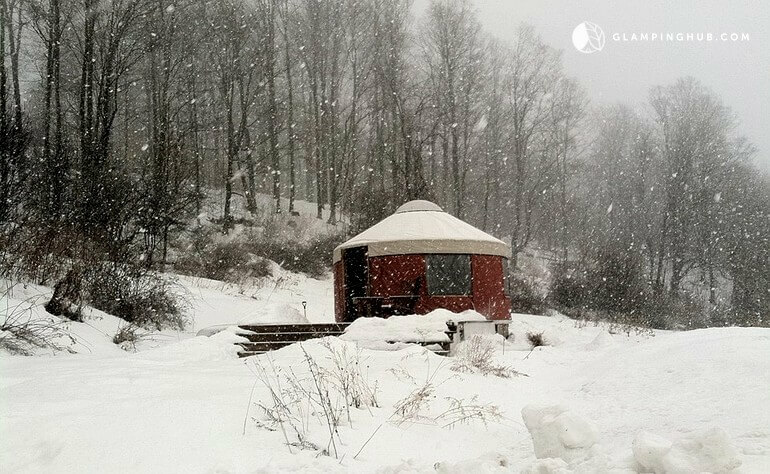 This beautiful and secluded yurt is located on 70 country acres in the town of Waterville, New York. You’ll find modern amenities like heat, a bathroom with a shower, and a small kitchen, plus room for three people on a queen-size and twin-size futon. A beautiful deck is perfect for lounging, and there is a barbecue grill for outdoor cookouts. Dogs are welcome here, and there are endless hiking trails to explore through forests and fields. This is New York glamping at its very best! This lovely, family-friendly yurt in New York’s Finger Lake region is nestled on 18 acres near hiking trails, orchards, and gorges. Amenities include a double bed and two twin-size beds, plus a futon in the living room, a flat-screen TV with a DVD library, a pellet stove, and a full kitchen and bathroom. Outdoors, you will find a playground for the kids, a lovely garden, and a goldfish pond. The property is very child and pet-friendly, and nearby Ithaca is a bustling town with lots and lots to do. In fact, over the summer, we embarked on a wine and waterfall road trip in the Finger Lakes that we will never forget. This upscale yurt in New York is perfect for a couple’s getaway near Cayuga Lake in the Finger Lakes Region. It features a king-size bed, full bathroom, a TV, fireplace, and kitchenette. Wi-Fi and air conditioning are also included. There is an outdoor patio for relaxing on, with incredible views of Cayuga Lake. Situated on 10 acres, this cozy yurt is very close to numerous activities, including hiking, swimming, boating, and wine tasting. There are four state parks located just short drive from the yurt. This small community of yurts in Upstate New York are located in the small town of Granville, which is near the Vermont border. 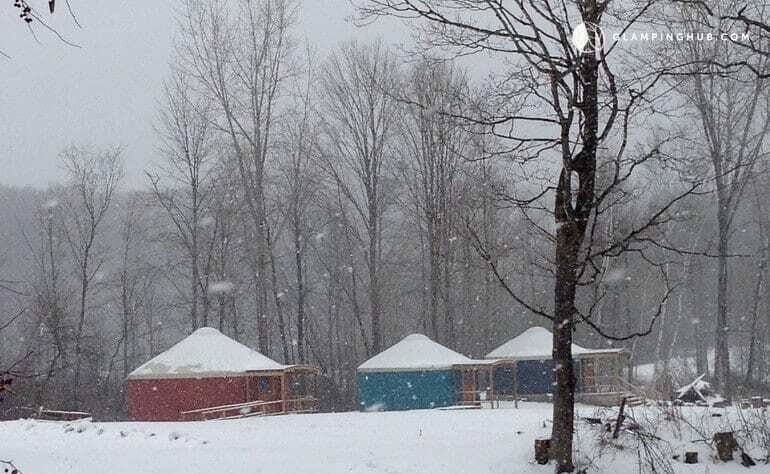 There are four yurts on the property, which depending on the size, can sleep between six and 11 people. Each yurt comes with a kitchenette, living, and sleeping area, as well as a picnic table and fire pit. There is no running water in the yurts, and restrooms are located in a separate building about 20 yards away. Additional amenities include Wi-Fi and a laundry room. 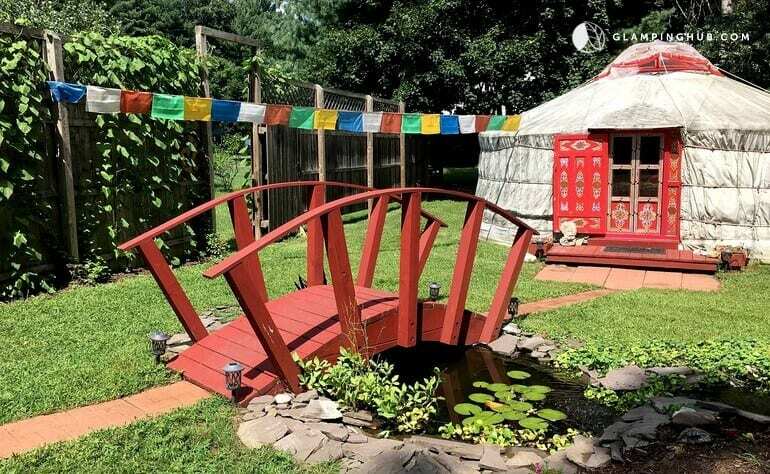 This is a perfect spot for community gatherings and family reunions, plus these New York yurts are pet-friendly. 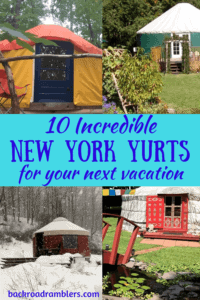 Looking for a more rustic yurt camping experience in New York? Check out this small camping yurt near Albany. It’s nestled on 225 acres in the woods and furnished with a queen size bed. An eco-toilet and an outdoor shower are located just a short walk from the yurt. While there are no kitchen facilities, you will find a firepit outside the yurt and a shared dishwashing sink for washing up. There is a natural swimming pool on the property, as well as waterfalls, trails, and a cave system. It’s truly an outdoor lover’s paradise and dogs are permitted too! If you’re looking for an authentic yurt experience in a beautiful location, you can’t beat this cozy little yurt in Saratoga Springs. 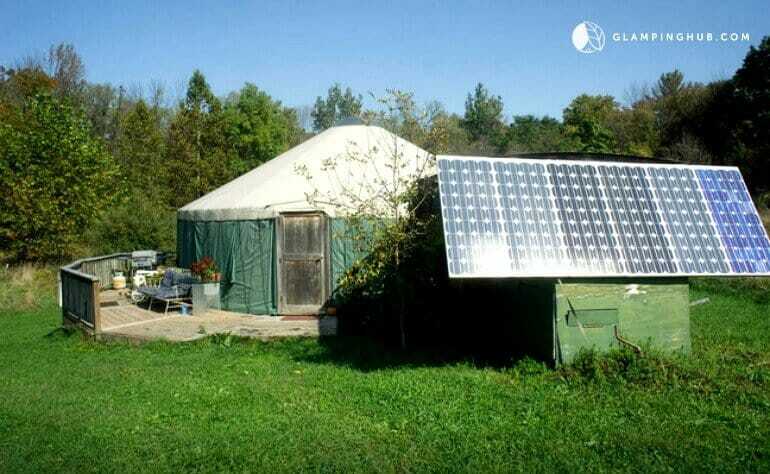 This yurt in upstate NY is perfect for two people and features electricity, Wi-Fi, air conditioning, and a pellet stove. Glampers have access to an outdoor shower, a half bathroom in the main house, and a furnished deck to relax on. The bustling and historic town of Saratoga Springs is a treat to visit in every season, and there are numerous state parks nearby for hiking, swimming, and adventuring. New York is a huge state to explore and we’re lucky that there are so many opportunities for exploring quirky and unique lodging throughout the state. 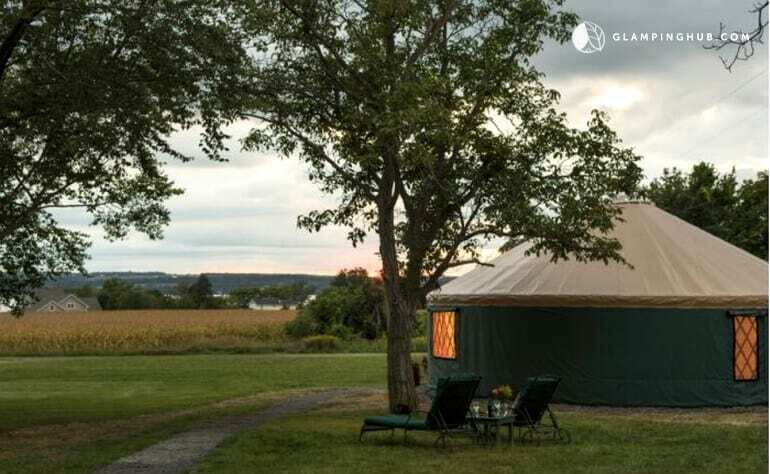 Whether you’re looking for rustic New York yurts or more luxurious accommodations for your getaway, Glamping Hub has some fabulous options — more than 1,000 properties available for rent in New York alone. 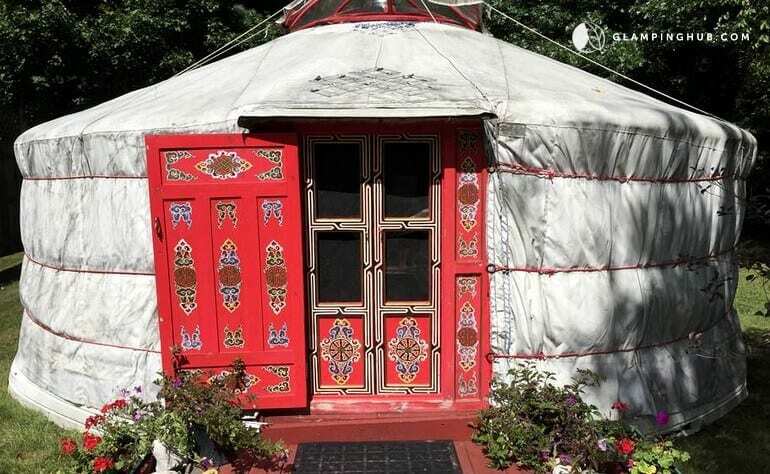 Have you ever stayed in a yurt? Please share your experience in the comments below.